Usually I have a ton of related picture books to share.... but apparently we don't read very many turtle-themed books! (Know of any good ones?) The only ones that I can remember us reading (and liking) are the Franklin books. Ok. Let's get to weaving some baby turtles! Let's Weave Some Baby Turtles! Once our paint dried (ours dried in a couple of minutes) we drew on a face and some toes. Then, we hot glued the turtle together. Now we grabbed our colorful yarn and got weaving. Ok. Then, we began weaving just like you would with a normal two stick God's eye pattern. We placed our yarn over a popsicle stick, wrapped it around once, and then placed our yarn over the next popsicle stick, and wrapped it around... and kept repeating that over and around process. And to change colors, we simply tied on another piece of yarn. Once we finished, we tied our last piece of yarn to our first piece of yarn. 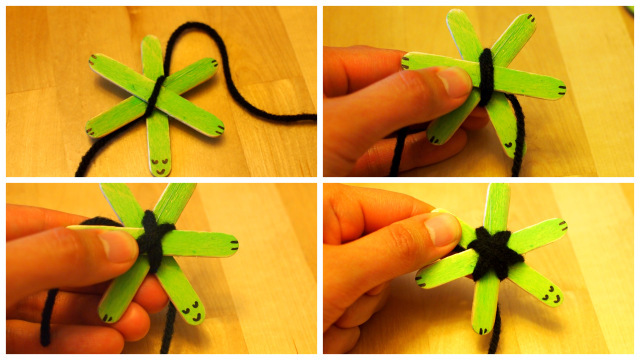 And if you liked this activity, you can find more weaving crafts and more popsicle stick crafts on the blog!